US and UK art collectors. Click on the thumbnails or links below for purchase details of each animal sculpture as a limited edition bronze. To see images of both of the horse sculptures above on the same page at a larger size, and for commission working details, see the Horse Sculpture page. 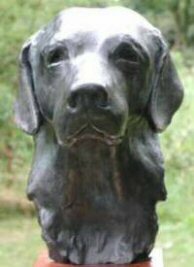 First in a series of dog portraits.... A modelled portrait (bust) of a labrador retriever called "Cooper" Smith... 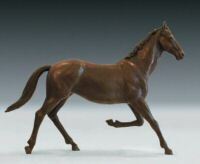 Shown here is a small picture of the bronze. Click on the thumbnails below to see larger views in bronze, or if you wish to see a terra cotta coloured plaster version click here. This was a commission by a North American art collector and his wife whose beautiful black labrador died in a tragic accident in the spring of 2003. 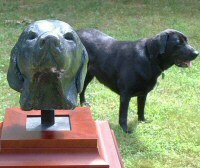 Another lab bust in bronze.... for a different client, also in the USA. Click here for larger view of this female dog sculpture portrait. Another dog bust in bronze.... this time an Italian Spinone bust, a commissioned dog sculpture for a client in England. Click on the Italian Spinone dog sculpture thumbnail below for a larger view.